President Donald Trump, right, listens during a meeting with Fabiana Rosales, left, a Venezuelan activist who is the wife of Venezuelan opposition leader Juan Guaido, as she speaks in the Oval Office of the White House in Washington, Wednesday, March 27, 2019. The wife of Venezuelan opposition leader Juan Guaido was welcomed Wednesday at the White House as she rallies international support for the ouster of President Nicolas Maduro. 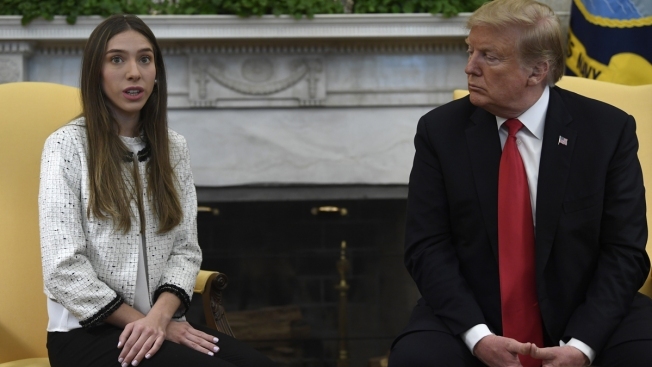 President Donald Trump and Vice President Mike Pence lavished praise on Fabiana Rosales, the wife of opposition leader Juan Guaido, who has emerged as a prominent figure in her husband's campaign to bring change to the crisis-wracked country. "We are with Venezuela," the president said at the start of a meeting with Rosales and other opposition figures. "What's happening there should not be happening." The United States was the first nation to recognize Guaido as interim president, asserting that Maduro's re-election last year was illegitimate, and has stepped up sanctions and other diplomatic measures in hopes of forcing him to give up power. Trump said the Venezuelan people have been through "unfathomable" trials under Maduro as food and medicine have become scarce, crime has soared and, more recently, blackouts have struck most of the country. An estimated 3 million people have fled, most to neighboring countries but thousands to the U.S. as well. 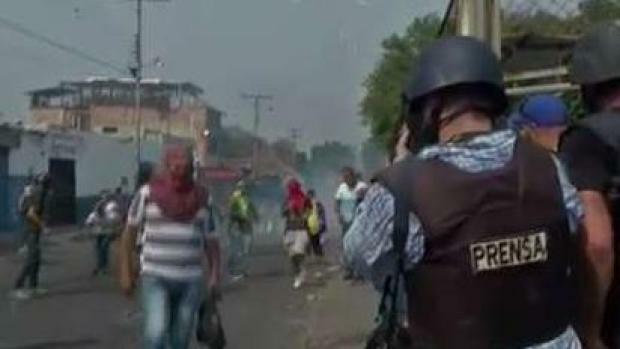 "Today, in Venezuela it is freedom or dictatorship, it is life or death," Rosales said at the start of the meeting. "It is the children who are paying the price." 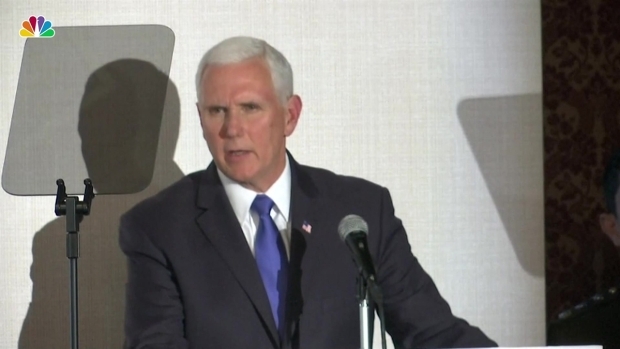 Pence called on governments around the world to stop supporting the Maduro government, singling out Russia for its deployment of military forces to the country over the weekend. "The United States views Russia's arrival of military planes this weekend as an unwelcome provocation and calls on Russia today to cease all support for the Maduro regime," the vice president said. Russia's Foreign Ministry says it sent the personnel in accordance with the Venezuelan constitution and a bilateral agreement with the government there. Among those at the White House meeting were the wife and sister of Roberto Marrero, a top aide to Guaido who was taken from his home in the middle of the night by masked agents last week. The government says he was the ringleader of a plot to bring hitmen from Central America to Venezuela to carry out assassinations. Rosales was scheduled to meet later with members of Congress and will speak at a conference with the ambassador recognized by the Trump administration.